I'd run a poll, but there are too many options. My favorite year for the Barracuda is 68, and for the Chally is 72. I have always prefered the looks of the 72-74 Challengers although the 70 & 71 has grown on me over the years. I like the looks of all the E-body Cuda's although if I had to pick I probably would go with 71. 72-74 challengers with the bumpers sucked in. I now own a 72 chally but way back when I owned a brand new 71. That was my favorite year. 71 is my favorite year for both!! Although I don't own one now . . . I still have some time!! I like the 70 Challenger and 70 Cuda but i would take any year. I`ll take a `70 `cuda,either Hemi or AAR but I think I like the `71 Challenger grill the best and I really like the `72-`74 Rallye. 71 of both are my favorites, but as said above, i'll take any 70-74 in either car! For me it was the 70 Challe T/A Red & black! :worship: The cudas Barring engine choice(of which by 74 there really was none (I got the 360) I do like the round tail lights, So I say 72/74, but give me a Hemi & I'll overlook the taillights(can't see em from the drivers seat anyway! ) Rich. 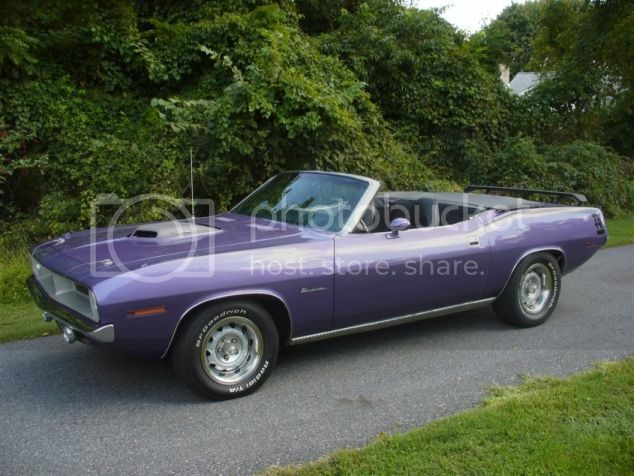 Definitely a '70 RT/SE for my choice of a Challenger and a '71 with billboards for a 'Cuda. For the Challenger, im go'n with a '70. And for a cuda(i love them all) Oh Geee, umm...mmm. A 71 CUDA! For Challengers it is definately 71. The 71s seem the most unique to me. Its like you see a lot of 70s at the shows and its hard to tell the difference between 72-74 so the 71s always stood out to me. Plus I have one lol. As for barracudas I would have to say 70 or 71 even though I have a 73 I just love the square tail lights. Too many projects and nothing gets done. Have 2-70 cudas, but love the 71's the most(only if it has billboards). Have 2-71 challies, but I like the 70 taillights with the 71 challenger grille. :dontknow: i guess the only way to settle it is to save some cash for a 71 cuda and a 70 challenger.